I feel ridiculously lucky to be living on the doorstep of Wapping Wharf, with its wealth of restaurants, bars and cafés proving FAR too tempting on those nights when I can’t be bothered to cook. It’s not just the nights either: I work from home and end up with cabin fever if I don’t leave the flat, so my day’s often punctuated by a coffee stop at Mokoko or a trip to Better Food for a matcha latte or a treat. Of course, Cargo is there too – and I’ve already written about meals at the likes of Pigsty and Woky Ko. 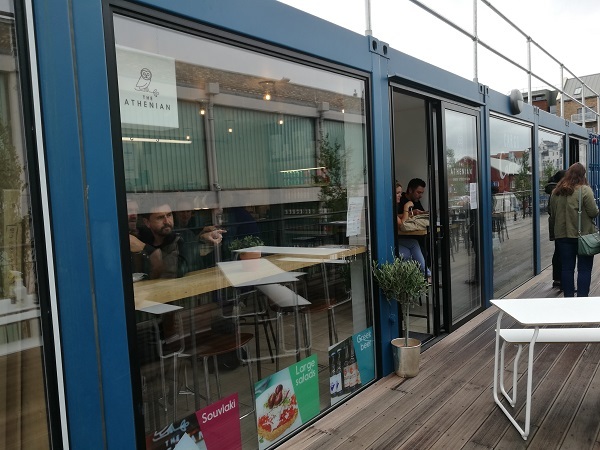 And now, there’s Cargo 2: a whole new set of shipping containers converted into some great food and drink places, ensuring that saving money is something that’s going to have to wait. 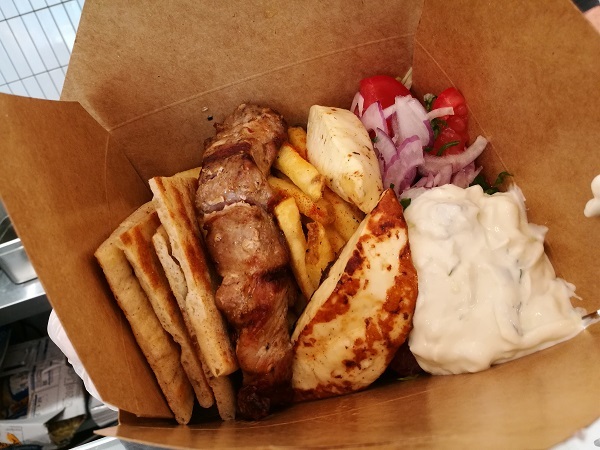 One day last week, I may have accidentally-on-purpose ensured that there was nothing in my kitchen that I wanted to eat, which of course necessitated a wander along to Cargo 2…and a stop at The Athenian to test out their take on Greek street food. It may be a tiny place, but it’s got a lovely light and airy feel, and space for seating both inside and out. You’ll find a chiller cabinet on the right with plenty of drinks and Greek chocolate bars to choose from, and the counter at the front, the charcoal grill topped with some meaty extraction units to keep the venue smoke-free and comfortable. While there were two Greek chefs manning the grills on the day of my visit – and Greek signage on the walls – it was good to see that it’s not about over-the-top, “My Big Fat Greek Wedding” style Greek, if you know what I mean. The Chiffons’ “One Fine Day” was playing in the background while I ordered – no Zorba the Greek here – and everyone who worked there was happy, friendly and jokey – it really does have a lovely feel. 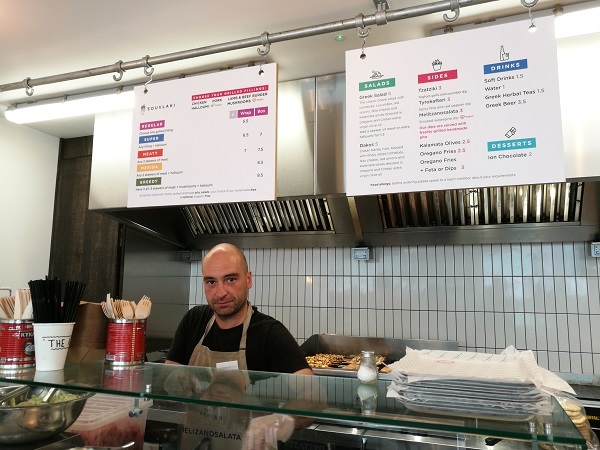 You’ll find the menu above the counter, and it’s very much focused on souvlaki: skewers of grilled meat (chicken, pork or lamb and beef burger) served in a pitta wrap. If you’re vegetarian or vegan, though, don’t worry: there’s halloumi and mushrooms on offer as alternatives – and it’s not just the wraps available either. Most combinations are available either as a wrap or as a box, ranging from a simple choice of one grilled filling right up to the dish designed for those who have more of an appetite: all three grilled meats plus mushrooms and halloumi, served in a box with fries, pitta bread, salads and your choice of sauce. There are salads and sides on offer too, and it’s all very reasonably priced. Being slightly obsessed with halloumi (well, I do have Turkish Cypriot blood running through my veins…), I went for the Super box (£7). “Should I go for the chicken or the pork?” I asked – partly to myself, but the lovely guy serving me replied, “well, the chicken’s healthier, but the pork’s tastier”. Pork it was. And it was definitely tasty. The big, meaty skewer was crisp around the edges from the grill, which also gave it a lovely smokiness – it was beautifully juicy and tender, and packed with flavour. The halloumi turned out to be two very generous slabs (I begrudge how much you pay for halloumi in some places, and how little you get! ), and the pitta was pretty greasy, but light and fluffy with a blistered golden shell from cooking. These were accompanied by herby, crispy skin-on fries with a light dusting of paprika, and parsley-flecked red onion, sliced tomatoes, and olive oil-drizzled shredded lettuce which added a fresher flavour. There was a choice of four sauces, but rather than the smoked aubergine dip, the souvlaki sauce with honey, herbs and mustard or the smokey and spicy feta cheese dip, I went for the classic tzatziki: rich, creamy and fresh in its flavour, with plenty of thin slivers of cooling cucumber. 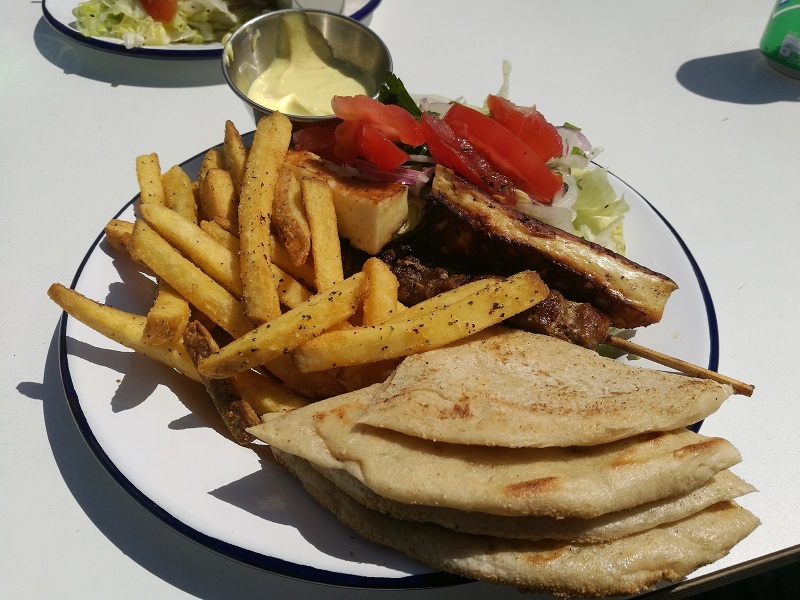 We actually headed back this weekend to enjoy lunch at The Athenian in the sunshine – and I ordered exactly the same meal again. This time, though, I opted for the souvlaki sauce – a sweet, yoghurt-based honey and mustard concoction – and as we dined in, our meals were served on melamine plates, offering the same great quality as before. The Athenian also offer a loyalty card scheme: your card is stamped with every visit, and once you’ve built up five stamps, you can enjoy a free souvlaki of your choice on your sixth visit. All things considered, it would be rude for me not to take advantage of it, wouldn’t it…? This post is part of a Bristol bloggers’ tour of the new offerings from Cargo 2! From July 9th, you’ll be able to read everyone else’s reviews via the following links…head over and have a read to whet your appetite, and let us know which restaurant on the list most takes your fancy! Mmmmmm those sauces sound tasty. One of each please! Pingback: Cargo 2 Launch: The Pickled Brisket – Stuffed.